Transcranial direct current stimulation (TDCS) serves as a tool that can potentially modulate the neural circuits in the brain. TDCS does this by increasing or lowering neurons' threshold for sending electrical impulses. There is a growing body of evidence that suggests that tDCS may be helpful in various psychiatric and neurological disorders. The European Chapter of the International Federation of Clinical Neurophysiology released an article in 2017 proposing Level B recommendations (probable efficacy) for tDCS effectiveness on addiction/craving, depression, and certain types of chronic pain. If you decide to buy a tDCS device, the process may be overwhelming. None of the tDCS devices offered online are FDA approved for medical treatment. Moreover, some of them have been shown to adversely affect cognition. I HAVE SIFTED THROUGH THE TDCS DEVICES THAT ARE CURRENTLY AVAILABLE ONLINE, AND HAVE ARRIVED AT MY 2019 REVIEW. THIS YEAR, THERE ARE ONLY FOUR ON OUR LIST. Below are the highest ranked tDCS devices of 2019. A few are tried and true devices that have been on my list in past years. These devices come from reputable device-makers and have been on the market longer than other devices. Please refer to our Neuromodulation page for more up-to-date information on tDCS and other noninvasive brain stimulation techniques. And please subscribe to our website to stay up-to-date on my articles and videos on tDCS as well as other brain-related topics. This tDCS device is one of the only medical grade devices on the market that does not require a prescription, and is is the only FDA-cleared tDCS device on the market. This is the device that I personally use at home. The device uses a single 9-volt battery (single 9V systems may be less effective at reaching stimulation levels adequately; however this has not been problematic for me- the stimulation parameters on the meter never indicate inadequate stimulation). 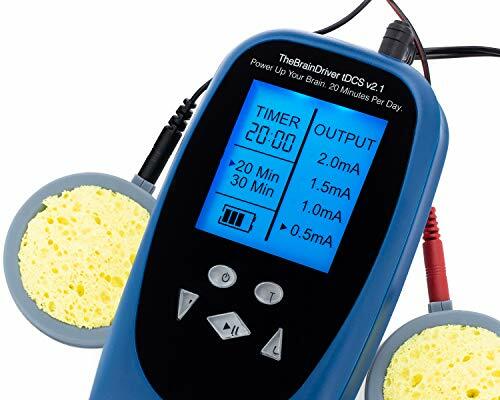 Pros: For the quality, price and ease of use, this tDCS device takes a close second place. ApeX Type A 18V Edition tDCS Device - Ultimate Bundle. Highest Rated, Analog Precision w/All Accessories Included. Device kit comes with everything included ( two headbands, which improves stability of electrodes on the head) except for the batteries and saline (easy to make at home-instructions are provided). 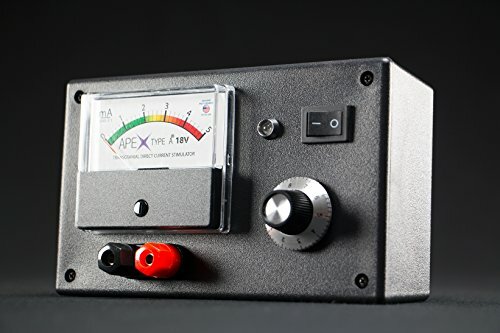 The built-in analog meter allows you to detect whether you have a good connection (ensures delivery of current through a complete circuit). The current dial allows you to decide how much current you desire and how quickly you want to ramp up the amperage - maximum amperage for this device is 2mA (the maximum current used in studies involved in tDCS). The 18V system is more efficient than commonly available 9V systems that may be unable to reach stimulation levels adequately. May not be as portable as other tdcs devices. However, it's light weight enough to carry around if you do need move occasionally (13 ounces). Headbands are not measurement-marked, so accuracy of electrode placement may be compromised. Not FDA cleared. However, it has been on the market for a long time compared to other devices (it was my first tDCS device ever!). I rate it highly because it offers quality at a more affordable cost. The product is offered on Amazon and Caputron. If you buy through Caputron’s website and use the coupon code 'NEUROGAL' you can receive a generous discount (link: https://caputron.com/products/apex-type-a-tdcs-device?variant=5427100024894&aff=4 ). The headset comes with fixed placement of electrodes. This makes it easy to use since you don’t have to measure electrode locations. This may be convenient for those whose only intention is to improve motor skills (i.e., enhancing physical abilities or playing a musical instrument more skillfully). The headset, while it may be easy to use, has a fixed montage protocol. In other words, the anodal and cathodal electrodes are fixed and so the device cannot be used for purposes other than sports skill enhancement or fine motor skill enhancement. For the narrow intended use of this device, it is costly. *Ratings are based on a 5-point scale and incorporate length of time on the market, quality of the device, cost, product’s ease of use, availability, and customer reviews from various websites. Disclaimer: Brain augmentation techniques such as those described in our website may not be reviewed or approved by the FDA. The long-term consequences may not be well-understood. However, we accept that use of these techniques occur, and we believe that offering responsible, harm-reduction, and scientifically-recognized information is imperative to keeping people informed. For that reason, the articles, guides, courses, and videos in our website are designed to expand knowledge of those who decide to pursue/research these techniques. The information and devices displayed on this site are not intended to treat, cure, or prevent any medical disease, and this article is not considered to be medical advice. If a reader decides to purchase and use a tDCS machine, it is his or her responsibility to use it correctly and safely and ensure that it works correctly. You should speak with your doctor if you have medical questions and should seek medical attention if you have a medical problem. Some of the devices sold through links on this website are associated with affiliate sponsorship of this website. Please note I received the caputron tdcs device as a complementary gift from the manufacturer. This did not influence my decision in including the device in the review.